Eight rugby players from the West Country were named in Eddie Jones' 34-man Six Nations squad, as England look to defend their title. Uncapped prop Nathan Catt, from Bath, has been called up to the squad and joins team mates George Ford and Jonathan Joseph. Lock Charlie Ewels, 21, also returns to the national side after making his England debut against Fiji in November. Winger Jonny May is the only representative from Gloucester, which is unsurprising following their disappointing performances in the Premiership this season. Despite Exeter Chiefs incredible run of form, only Henry Slade and Jack Nowell get the call up. 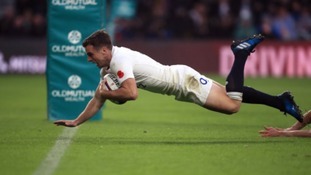 England head to Portugal on Sunday for a three-day warm weather training camp, to crank up preparations for the Six Nations opener against France. While Jones fully admits England's top current aim is to retain their Six Nations title, the former Australia boss also conceded he is determined to build the leadership qualities in his squad. "It's about developing players' leadership skills," said Jones. "What is being a leader? Being a leader means every day you rock up to training, rock up to a meeting, and you get on with the job. You do it to absolutely 100 per cent. And if the guy next to you is not doing it properly, you tell him he's not doing it properly. And you tell him how to do it." "When we've got 10 players like that, then we'll be in a position to win the World Cup. We're not there at the moment, but we'll get there. And we've got to look at each player that potentially has those set of skills, and work out how we can improve that player. Whether he needs help in his presentation skills, whether he needs help in his assertiveness skills. It's all about professionally and personally developing the players."